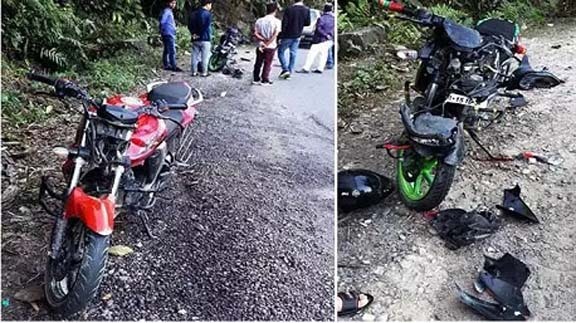 A student died on sport while two others were seriously injured after two motorcycles collided head-on Saturday on Jullang-Papu Nallah road in Itanagar. According to a report published on Sunday by Arunachal24.in the deceased has been identified as as Yumlam Eiha, who is a student of the Government Higher Secondary School at Itanagar. As per the report, the Yumlam Academic and Career Foundation Society (YACF) condoled the demise of Yumlam Eiha, who is the son of Yumlam Tagiu of Yumlam in Koloriang circle under Kurung Kumey district of Arunachal Pradesh. The YACF in its condolence message said Eiha was a student of Class XI and was a sincere and dedicated youth of the community. The premature demise of the young student has created a vacuum in the family and the society. The YACF prayed for the eternal peace of the departed soul and rest in heavenly abode. The NGO also prayed for early recovery of the youths who were critically injured in the bike mishap. It has been reported that two motorcycles had collided head-on on Saturday afternoon on Jullang-Papu Nallah road near Himalaya University in Itanagar at around 2 pm. While Yumlam Eiha, who was a pillion rider, died on the spot, the rider was admitted to a city hospital in critical condition. The condition of the other injured youth, who was coming from the opposite direction, is stated to be critical and has been shifted to North Eastern Indira Gandhi Regional Institute of Health & Medical Sciences (NEGRIMS) at Shillong.